Solano Jacket - Mens is rated 4.7 out of 5 by 6. Rated 4 out of 5 by AlbinoPancakeDevil from Great Spring / Fall Piece I really (really, really) like the cut of this jacket - I'm 178cm/70kg and usually find it difficult to find jackets long and skinny enough for me, while this jacket is bang on for sleeve and body length and overall size. 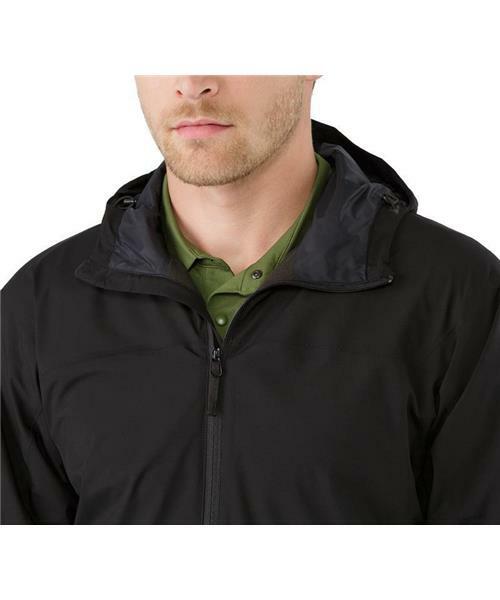 It's windproof and water resistant, which makes it great for casual bike rides around town or cool hikes in the forest. My only gripe (and reason for 4/5 stars) is that I wish the hand pockets were bigger - my average sized hands barely fit into them. I would love a revision of this jacket with bigger hand pockets (and another version with no liner for summer wear / higher layering versatility). Rated 5 out of 5 by Will from Awesome fit Extremely light as advertised, although not as light as the Celeris (not sure anything can be lighter than that jacket), but then this has different uses. Bought the volcano colour which is a very nice slightly darker red and the fits true to the athletic fit profile. I just wear it for spring/fall type temperatures. The interior fleece and inside the collar feels great to the skin, very soft. Rated 5 out of 5 by Ken01 from Top Notch I was looking for a lightweight windproof jacket with no specific brand in mind, mainly for use in late Spring and early Autumn. Browsing the racks I came across the Solano Jacket, tried on my size and perfect fit. After a few outings a can honestly say this is one of the best fitting jackets I have purchased and also my first Arc'teryx garment. It certainly won't be the last. Top Marks. Rated 4 out of 5 by eclectocrat from Very nice jacket, miner gripes First the bad: The pockets are indeed quite tiny, but I guess the patterning necessitates that. The neck is too tight for my liking. Having worn the jacket for a week and breaking it in a little, I find the neck less annoying then at first, but it can be a little snug zipping up all the way over a button up collar. I think I will get used to this eventually; it's not choking me. The good: Very comfortable, very good looking, great wind protection, totally suitable as a rain jacket for city commutes where you go in and out of dry places. Overall: I think the pros easily outweigh the cons and I think I'll be using this jacket a lot this year. I wouldn't expect this to be much use in active pursuits except perhaps shoulder season hiking, but there are better shell options for that anyway. If you need a jacket to walk to work, or walk the dog, then this is really perfect. Rated 5 out of 5 by AJY99 from Great All Round Jacket One of my favourite Arc'teryx pieces, this all round jacket that looks great and feels great too. The soft, brushed lining feels nice and adds just enough warmth for chilly transitional weather days. The cut and mimimal detailing makes this jacket a great choice for urban adventures, while the WINDSTOPPER® softshell material breathes well during more active pursuits.